Cowboy boots, hats and other essential western wear can all be found at our Trail Rider Store. The Trail Rider Store is a cornerstone heritage business of Banff National Park and our company headquarters for the largest horse outfitting operation in Alberta. Located in the heart of Banff Avenue’s historic 100 block at 138 Banff Ave. In April 2014, new partners stepped in providing the perfect opportunity to re-vision this 50-year landmark with latest in western fashion, lifestyle, and gifts appealing to today’s visitor and local customers alike. 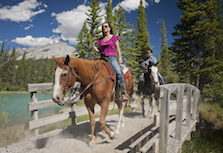 Our hand picked collections will fashionably take you from the street to the saddle embracing the Banff Western Lifestyle.